My son seemed to be born with an interest in language, letters, words, and reading. As a toddler, he would trace letters with his fingers wherever he saw them, including on sidewalks and car license plates. He started to read when he was just two years old and reading became his favorite activity. Being a good mom, I bought him beautiful, award-winning picture books. Such books, I knew, would encourage him to use his imagination. I anticipated that we would look at them together and we'd talk about the pictures and the stories behind them. However, when I gave these beautiful picture books to him, he'd open them up, take one look at the pages, and then angrily throw them on the floor, saying quite emphatically, "No words!" He hated picture books. If given a choice between a book and a toy, he'd pick the book every time. I'd take him to museums and at the end of the day, we'd visit the gift shop, where he'd find the books. 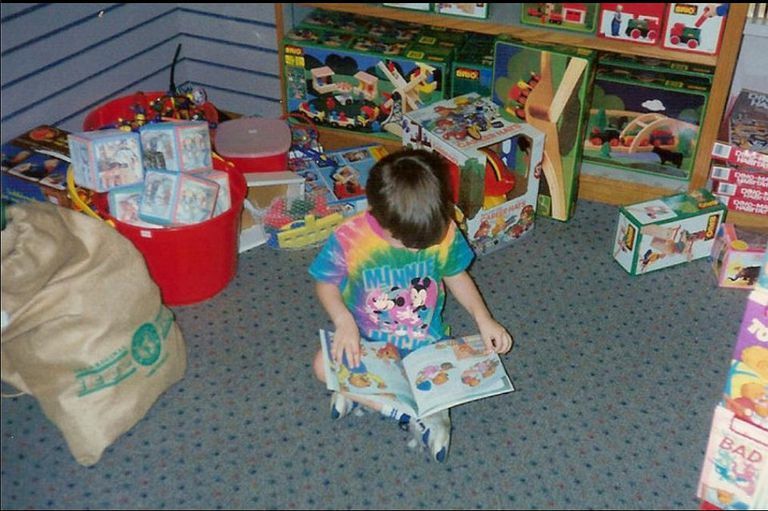 He'd pick out a book, plop himself down, and read, ignoring the toys. We'd go to Toys R Us and he'd make a bee-line for the book section Once there, he'd pick out several books, sit down at a table and read. If I had let him, he would have sat there reading for hours. We'd leave without him looking at a single toy. He wasn't interested. When he was a little older, he developed an interest in science and those it was the science books he'd read when we'd visit Toys R Us. On our way out of the store, I would direct him to the section with science toys. He'd look at them and sometimes seemed to show an interest in one particular toy as he would pick it up and investigate it carefully, reading whatever was on the package. I'd think, "Okay! He's like other kids. He's interested in a toy!" So I would ask him, "Would you like to take that toy home?" He'd say, "No," and then put the toy back on the shelf. At birthday parties, he'd sometimes sit off to the side reading whatever was available, including menus. At his own birthday parties, he'd read out loud every birthday card he got -- before opening the gift. And his favorite gifts were books. We didn't buy many books, though, because my son would read most books once and that was it. It could get quite expensive feeding his interest in reading. By the time he was three, he had his own library card and each time we visited the library, he'd get as many books as he could on his card. That wasn't enough, though. I'd have to get as many books as I could on my card as well. That was eight on his card and eight on mine. We went to the library every week, so he read sixteen books a week. When we ran out of books on his favorite topic at our local library branch, we'd go to another branch the next week. We visited five different library branches often. This kid was unlike any other kid I knew. He was just three years old, had not started talking until he was two, and still wasn't talking very much. He was so focused on reading that I worried he might have hyperlexia, which is a form of autism. He doesn't have it, but for a while I was genuinely concerned. I know I'm not the only parent who worried that something was wrong when her gifted child was exhibiting pretty typical gifted behavior. Was there a time when you thought something was wrong with your child when it was just normal gifted behavior? Share your story!